A certain piece of Japanese art has managed to appear both ubiquitous yet hard to pin down. It is splashed across city walls and often serves as a sweeping backdrop for many a bedroom wall. It has a cameo in a Wes Anderson film, it provides the inspiration for album covers ranging from Folamour to Debussy and is the only piece of art to feature as an emoji. The piece is called The Great Wave off Kanagawa and comes from a tradition of Japanese print making called ukiyo-e which translates as “pictures from the floating world”. Set against the backdrop of Mount Fuji, the artist, Katsushika Hokusai, gives us a striking image of merchant sailors caught in the middle of a sublime, awe-inspiring wave. In both aesthetic and character, it has captured the imagination of many and proliferated across many mediums. Originally created in 1831 it has remerged as an iconic image in the 21st century. But beyond the Great Wave there is much to be discovered about the pictures of the floating world. 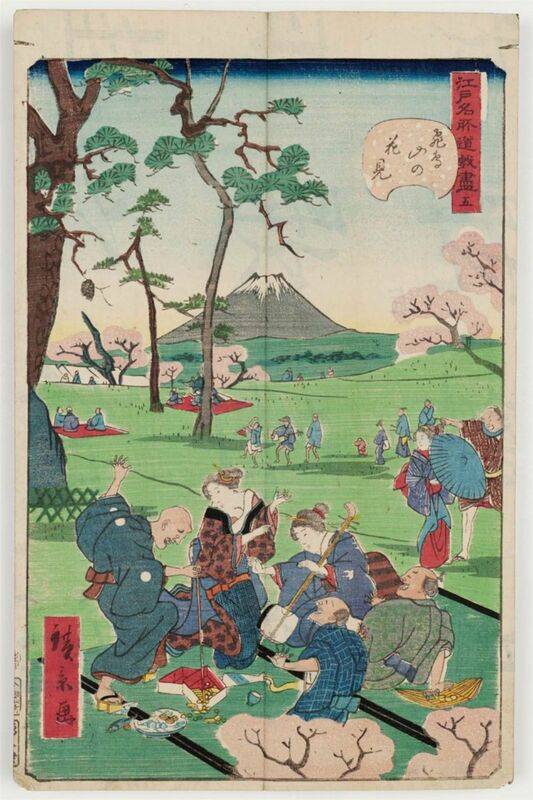 In both design and shape ukiyo-e is typically Japanese in its precision and functionality. The lines sweep across the page, sometimes dramatic, sometimes subtle, always exact. The images convey a celebration of the ordinary: the workers, the artisans, the pleasure-seekers, the everyday folk. It depicts a culture where the events of the everyday have special meaning and each story is worth telling. The period in Japan which gave life to ukiyo-e, the 16th to 19th century, was a time which put shoguns and samurai rulers firmly at the top and the merchant class securely at the bottom. During this period of rule, Japan was cut off from the world and developed a very distinct and unique cultural narrative which utilised a new technique for producing art. The removal of long-term aspirations left a creative space to appreciate the short-term. It popularised the perspectives of groups of people suffocated from social mobility. 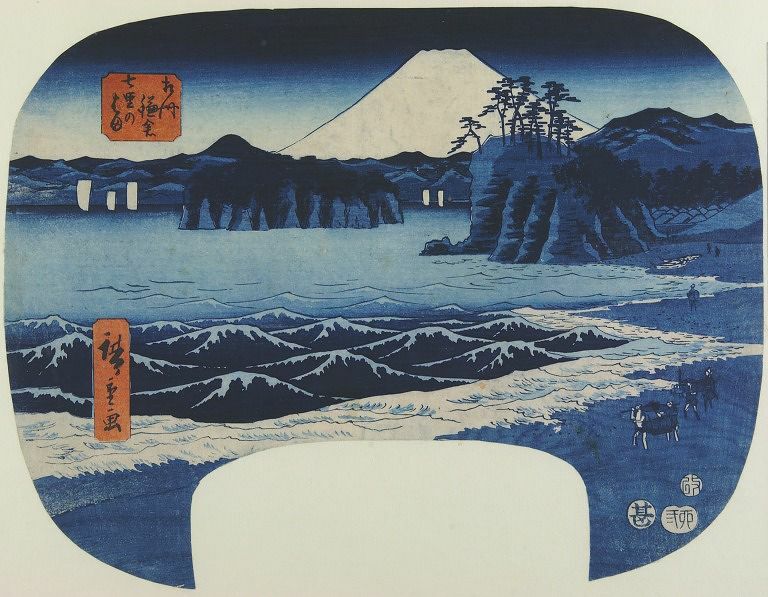 Music, art, theatre, socialisation and sexual fluidity were elevated to accepted social norms by a woodblock printing technique that allowed mass scale production of high-quality art. Art can often be unaffordable and pretentious, but ukiyo-e was a way of overcoming this spatiality. It is made to be accessible in both its themes and its price. From the masters like Hiroshige to more contemporary names like Toshi Yoshida, this artform was meant to be available to a large audience and not just an elite. Hokusai is credited with over 30,000 pieces of work to his name. And for someone of his standing his art is still available at prices unthinkable in comparison to his Western counterparts. An 1831 first edition Great Wave was sold at the same price as a bowl of noodle soup. ‘To make a print requires the skill of three: an artist, a carver and a printer. This process is intensely technical in order to produce a quality piece of work can take decades of practise. To master the craft can take a lifetime. First, the artist produces the work using black ink, called sumi, on thin paper. The artist transfers the piece to the carver, who places it face down on a block of cherrywood and makes their engraving. This is then transferred to the printer who aligns the paper up and with each press can apply different colours and depth. 200 pieces can be made per day using this technique and up to 10,000 in a lifetime of a single block. As a modern practice ukiyo-e has entered a period of decline because of the intense skill required but its popularity has found a global audience. There a few artists from the floating world more popular than Hokusai who had the unique ability to draw, engrave and print. He created mythical worlds where tradesmen haul their craft across a bridge above the clouds, precarious yet beautifully peaceful. He revealed to us how the boundary between nature and humanity can be broken down as the fisherman casts his net into the sea, blending seamlessly into the landscape. He encourages us to take a more intimate perspective on our relationship with our environment. Work with it, wonder at it, even fear it, but don’t destroy it. His relentless passion continued until his deathbed, wishing ‘If only heaven will give me another ten years… then I could become a real painter’. He died aged 88 as poor man but one who never lost his lust for life. He was determined to foster a culture that promoted the well-being of the human experience. He possessed the ability to excite but also to entrance. He wanted to show that in any situation, it is important to take a step back and reflect. That, you should try to be mindful of your impact on the world and the ways in which it impacts on you. He is born from a culture which can express what the English language does not allow. Our sentences must either have a subject either perform an action or have an action performed to it. Japanese language and culture are free from this constraint and permit something more. The word komorebi directly translates as ‘beams of sunlight streaming through the trees.’ But this is not strictly speaking accurate. However, in Japanese it more of an experience: ‘existence in a state of harmony with nature as the light shines through the leaves of a forest.’ A state of mind can exist without doing something or having something done to you. As an artform there is much to it than just The Great Wave. Ukiyo-e’s depiction of both human nature and the natural world are themes as relevant today as they were to Japan. At once it is capable of portraying intricate stories of mythical proportions as well as igniting an introspective, sedate meditation. It offers a delicate perspective with which to help contend with the fears of the future. It is gentle reminder to be aware of the myriad of joys around us and not to feel too dismayed by a world in turmoil.